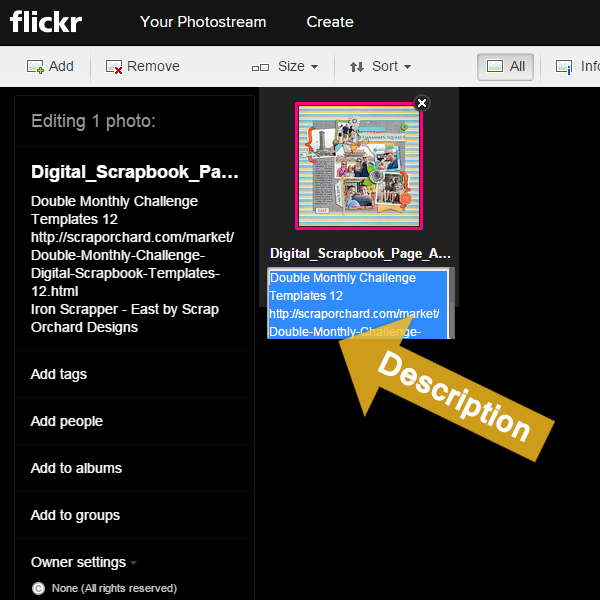 Scrapping with Liz: Even More Reasons to Love Flickr! A while ago I told you all how much I'm loving Flickr. After that post, Jenny gave me another reason to LOVE Flickr. 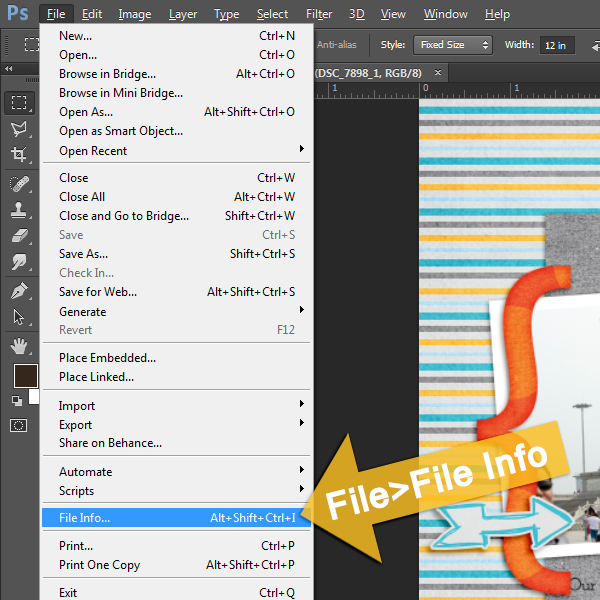 She told me that if I add my digi-scrap credits to the "File Info" date in Photoshop that when I uploaded to Flickr my credits would automatically appear. What?!? I had to try it out right away. Let me just say that it is AWESOME *said in my sing-song voice*. I'm just going to show you how awesome it is. 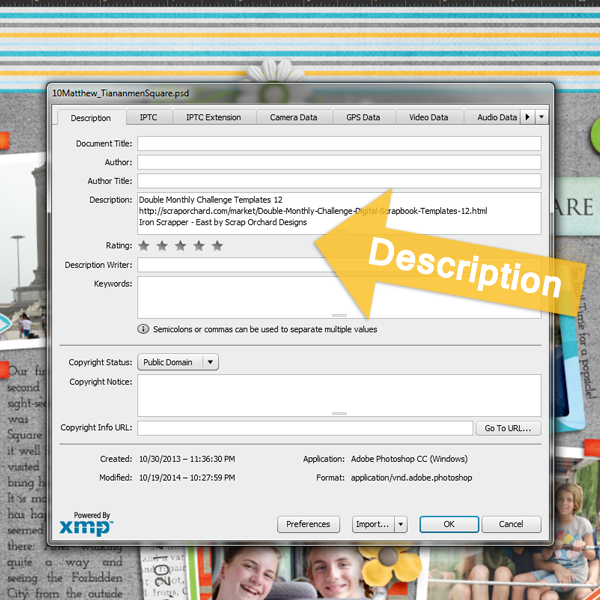 When you upload your .jpg the description will automatically upload to Flickr too. Make sure that if you are saving for web that you copy that File Info into that document as well because the info doesn't transfer over. It took me a couple tries to figure that out (actually my team member, Tiff, helped me with that one) because when I upload to galleries and such I usually save for web. And there you go! You can edit it if needed. From there I usually copy the credits for uploading to other galleries. Some of you are probably like, Wow!, Liz, you were living in the dark ages, time to get caught up on technology. But seriously, it takes me a long time to get the hang of new things. So, if you already knew this little fact you can just be happy that I'm so happy, and if you didn't know this then I will totally understand how excited you are right now. Courtney suggested that I start a Scrapping with Liz Flickr group, and I thought that was a great idea! I just set one up and I would love to see all your pretty pages over there. Who knows, I might even play some games and have prizes for pretty pages I see over there. So, is there anything else I just have to know about Flickr? I didn't know that little detail, and I think it's awesome too! Thanks for sharing! This is cool, thank you. I put every page on Flickr as soon as I make it as a back up system (I have several). The description often holds me up but if I get into the habit of doing it this way it should be more streamlined. I've asked to join your Flickr group.